The Inuit World was the most complex project to come out of the Typography Studio in Cape Dorset. It consists of a soft covered, bound book 8 1/4”x 12”. There are two signatures sewn through and those are then (glued) bound to another sheet of the Ragston S-N paper and then glued to a heavier tan paper, about 250 gsm (grams per square meter) with a decal on the lower edge and a cut edge on the top. The cover has two large flaps that fold over approximately 6 3/4” each side to hold the front and back pages of the signatures end pages which are of an off white colour bearing the watermark Ragston S-N, the weight of the paper is approximately 180 gsm. The end page explains that the type used was 14pt Van Dijck Roman and italic. 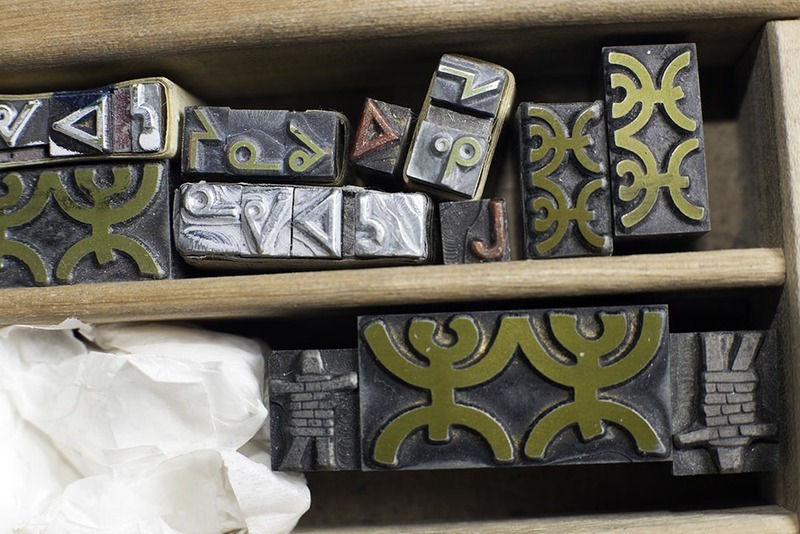 The type was set by Pia Pootoogook and Udjualuk Etidlooie both of Cape Dorset under the direction of Will Hudson. There are 26 numbered pages and seven unnumbered. The book is Copyright 1977 Kingait Press, West Baffin Eskimo Co-operative Ltd. isbn # 0-9690692-0-0. On the third page of the book there is an explanation of the contents in 36 pt uppercase type Hadriano Stone Cut and Hadriano font, justified center, a lovely broadside all on its own. Notice the lower left the inverted inscription GAU 632-P, no idea what that is. The type size in the above text changes from 36 pt to 30 point at NAMES IN ENGLISH and below, just an observation. I that thought that this page was set in type but here you can see it was made the same way the image plates were made. If Wil didn't have this font in Dorset perhaps he asked the designers to set this up for him so he could include it in the publication? Another detail, back in the day Kananginak was spelling his name Kanangina and later when I knew him it was spelled Kananginak. Likewise Wil founded Kingait Press and during my time here it was changed to Kinngait to reflect a new thinking on how the language was to be pronounced in English and written in Roman Orthography.. The completed book was then set inside a clam shell box of Milori blue and on the spine was attached the identifier “The Inuit World . Kingait Press” in 24 pt Hadriano Roman font. Inside the box you’ll find an envelope of the same coloured paper that encases the box measuring 8” x 11 1/8”. On the outside of the envelope is a printed label (3.25 x4.5”) of tan paper adhered to the envelope which says “THE INUIT WORLD” and then the small dingbat inuksuk and “KANANGINA”. Two sizes of inksuit dingbat, one used in this project. 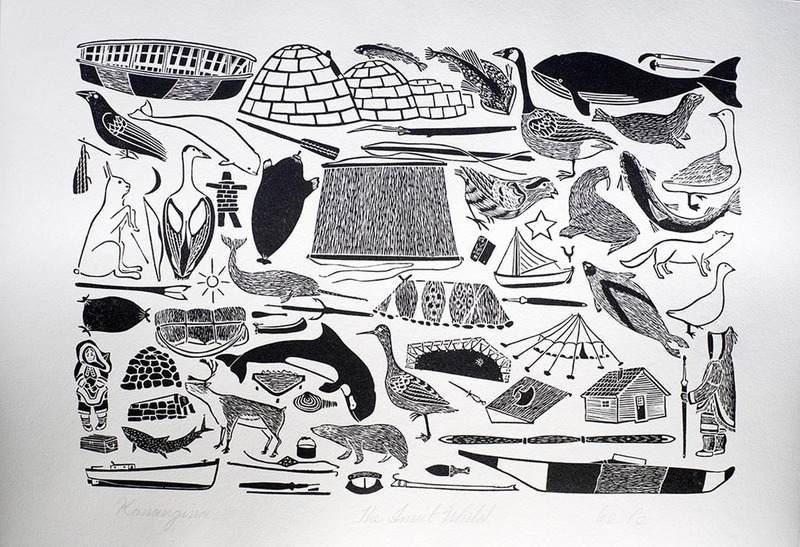 The signed print that accompanies the Inuit world. Inside the envelope you’ll find the illustration signed by Kananaginak on the lower right and titled (by someone else) from left to right Kanangina and then The Inuit World, in English with no edition nomenclature. The illustration is printed on a heavier white stock with no watermark that I can detect and has one decal edge on the right hand side of the paper. Had these illustrations been hand printed I would have thought the impression would have been designated by the normal edition nomenclature of 1/1000, 2/1000 etc. There was an alternate box color that are exactly the same size and manufacture as the dark blue edition box, it is a clam shell card box covered with a pale green color but it was not used though quite a few remain in the archive. The original illustration was cut into this lino block. 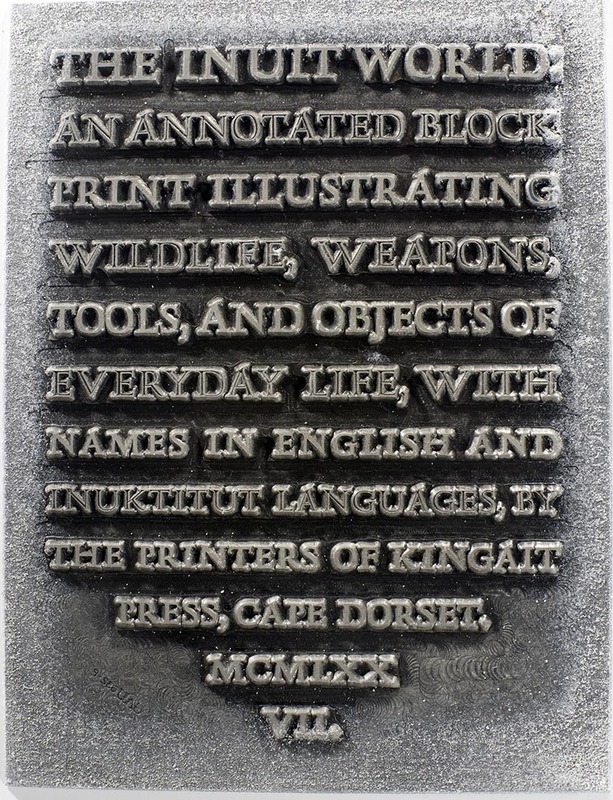 The lino block was either printed in Dorset and then sent to Boamac Battan or the block was sent and they printed the necessary impression so they could take a photograph and produce a negative. The negative was then exposed onto the photo emulsion coated plate and then etched. On the left hand side of the plate you can see the zinc plate oxidation. On page number one there appears this diagram that is annotated numerically to help the reader who is unfamiliar with Inuit ethnography and/or wildlife to navigate the descriptions. The rest of the book is designed to identify and explain the objects is in the illustration. So number 1 is the Umiak, number 2 is Iglu and so on. You can see the oxidation on the top of this plate as well. The blue material is the photo emulsion that remains on the plate after developing. 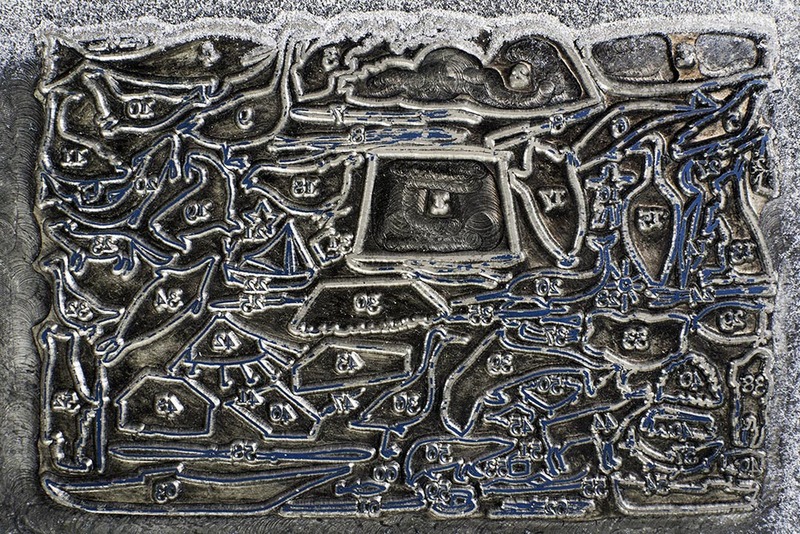 The annotated diagram was also made into a zinc plate to withstand the printing of over 1000 impressions. Wil Hudson obviously understood that lino blocks would never withstand the mechanized printing so he had these plates made. They were mounted on board so they would print type high along with the type of the project. There are quite a number of insights included in each description including the inuktitut words for certain items which helps the reader understand the complex and comprehensive nature of the Inuit World of the Sikusiilaq as Cape Dorset was called before Captain Luke Fox named this place for Edward Sackville, 4th Earl of Dorset on September 24, 1631. Crispen Elsted of Barbarian Press mentions corresponding with Wil about wanting to acquire a copy of the Inuit World…. It's good to hear from you. I've checked through the Index to Fine Print (we have a complete run) and then looked at the entry for Wil. There isn't an article per se, but in FP Volume 3, No. 3 (1978) there is a very positive review by Linnea Gentry (I assume, as it is signed 'LG') of Inuit World, which he published with his Inuit students at Kingait Press in Cape Dorset. In the same issue there is a letter from Wil to the magazine talking about the processes of making the edition, and two half-tone reproductions, one of the title page, and the other of the print which was enclosed with the book. I am of course kicking myself for not having bought the book at the time, although I do remember considering it. Copies don't show up these days. At the time it was $75 -- a price Wil apologized for in his letter, blaming the $1.05 a pound shipping costs from Montreal to Cape Dorset for everything from paper to type. I couldn't find anything else in Fine Print about Wil or the press, or about his syllabics.